The first 10 minutes of class – Can I Get a Pencil? I’m a firm believer that students need time in class to read books of their own choosing. I’ve been implementing this approach to literacy for over 3 years now, basically from the moment I finished reading The Book Whisperer by Donalyn Miller. For the past two years (and half of this year), I’ve always blocked out several work sessions a week to allow the students 15 to 20 minutes of unobstructed time to read a self-selected book. The problem that I’ve wrestled with for some time, though, is that there is never enough time to do all the things that I need to do with the kids. They can’t just read their own books; we have to have mentor texts that we can use together so that the students can work in small groups to practice all the skills that go along with being a good reader (making inferences, learning new vocabulary, recognizing and understanding point of view, explaining how setting affects both the characters and the plot, conflict, etc., etc., etc.). If I give them two to three days a week to read their own books, then that only leaves a couple of days to work on all those aforementioned skills. Oh, and I have to teach them how to write the following genres: narrative, explanatory and argumentative. There just isn’t enough time. I always feel like I’m taking away from something else, and that makes me feel guilty as hell as their teacher. This week, though, I stumbled upon a podcast called Teach Me, Teacher that offered me a solution to my aforementioned problem: read at the beginning of class. In the first episode that I listened to, the host, Jacob Chastain, interviewed THE Donalyn Miller, and he divulged to her that he has his kids reading from their self-selected texts for the first 15 minutes of every class. Chastain claimed that using this opening portion of the class actually helped him to reduce wasted time in his lessons because his students were on task as soon as they walked into the room. His class periods are slightly longer than mine, so I couldn’t reconcile using 15 minutes, but this week I started off all my classes with 10 minutes of independent reading time followed by a “Status of the Class” update and a short reading response in their journals. Then we moved into whatever skill I wanted to cover that day using either a newspaper article or our class novel. I’ve only been implementing this strategy for a week, but so far I am loving it. The kids know that as soon as they come into the room they are to find the book that they are reading and get to their seat so that when I walk in they are ready to begin. Historically, I had what we call a “Brain Crank” or “Warm Up” question on the board that the kids are supposed to answer when they come into my room. Typically, this could be a quote from a book we are reading or something else that requires them to make an inference. The problem, however, is that I teach 7th graders, and they get very little time to socialize throughout the day other than the two minutes when they are in the hall transitioning to their next class. So when my students enter my room, they are not all going to be 100% committed to sitting down and starting my warm up question. Inevitably, several students will not have even remembered to grab their composition notebooks on the way into class. Several more might have managed to get their notebooks, but by the time I enter the room they are still resting closed on their desks. And generally anywhere from 3 to 10 kids are in need of a pencil, hence, the name of this blog. By the time all of those issues get resolved, we’re a couple minutes into the lesson and my students are just now attempting to tackle the question. Four to five minutes later, we go over their responses. All and all, this task can take anywhere from 6 to 9 minutes. However, the process of getting a book and starting to read limits most of those roadblocks I mentioned above. Plus, while the kids are reading, I can knock out all the little house-cleaning tasks that teachers have to go through before class can really begin: take attendance, hand out pencils, pass out handouts or articles, etc. This also gives me a chance to jot down what titles everyone is reading and notice who’s sticking with a book and who’s giving up on what they read the day before (which means I know who I need to talk to ASAP). I can already tell I am not wasting as much time as I was before when I had the warm up question routine. My lessons are tighter and the kids are reading more on a daily basis. Also, they are reading from multiple texts in one lesson period, which helps them to recognize the similarities and differences in content and style that exist across books. One other perk of this new strategy is that having the students begin a class by reading independently is a great way to chill everybody out, and it sets everything up for a productive lesson. I have about eight students now spread out amongst my five classes that have read Long Way Down by Jason Reynolds on their own. Each of them was frustrated with the ending. They didn’t understand why the author didn’t provide them with a clear-cut solution that neatly wrapped the story up at the end. As I alluded to above, middle school students do not have a lot of unstructured time, and nor do the teachers for that matter. 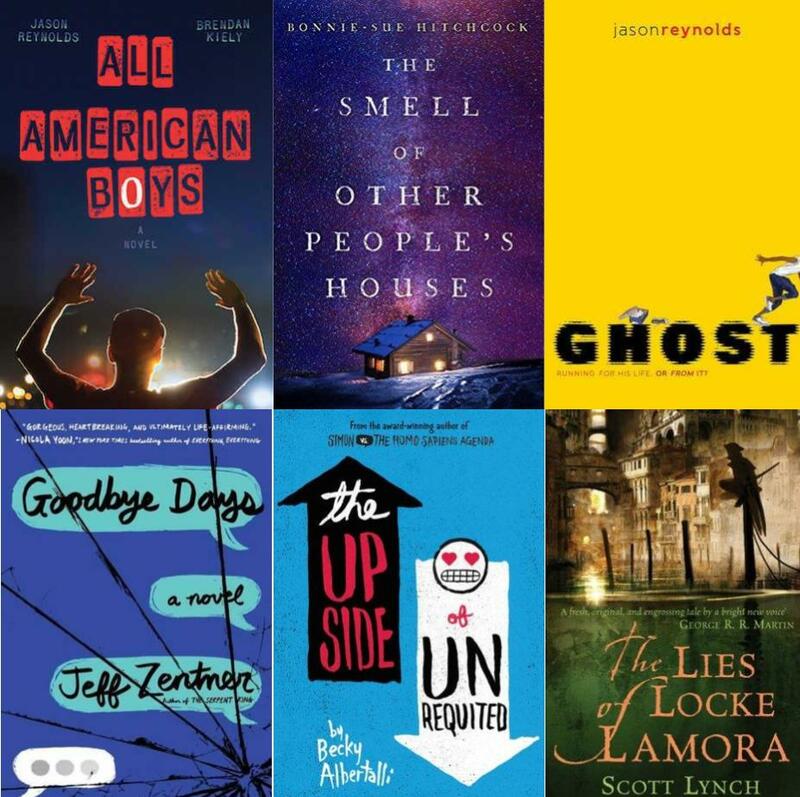 If I were a high school teacher, I wouldn’t have to eat lunch with my students, and I could host small groups to discuss the books that we were reading or that we had recently finished. Alas, this is not the case for me, but I wanted to get these students together so that they could vent about the book in the same place. So I snagged them one by one on Friday and brought them into my homeroom and let them go at it, which was awesome! They all expressed their frustrations with the book’s conclusion, and then looked to me to provide them with some sort of comfort or solution to this transgression by Mr. Reynolds, to which I just shrugged my shoulders (which led to more arguing). I want these little organic book discussions to happen more amongst my students who have read the same book, and I’m going to make a goal for 2018 to figure out how to make this happen on a more frequent basis. Someone that I follow on Twitter last year posted that they hold “Rock, Paper, Scissors” tournaments in class to give their students a quick mental break, and I wish I could remember who that person was because I would gladly send them a gift card to their favorite restaurant. This year, I’ve held regular tournaments in my class, and I have found them utterly delightful. First off, they take no longer than 3 minutes to complete, assuming you don’t go best 2 out of 3 (even with twenty-something kids in the room). Second, they get the kids out of their seats for a few minutes, which is always a bonus. Lastly, they are a refreshing break from the content and they are absolutely hilarious. I’ve yet to host a tournament that didn’t involve at least one kid that couldn’t seem to grasp that it’s “One, two, three – shoot!”, and after several failed attempts the entire class is usually in stitches. Posted on January 20, 2018 by mps2341. This entry was posted in Middle School ELA and tagged independent reading, jason reynolds, middle school, students, teacher. Bookmark the permalink.